This 19th-century bardic chair (right) was awarded to Gareth’s great-grandfather for his skill in a regional eisteddfod, a competitive Welsh music and poetry event. 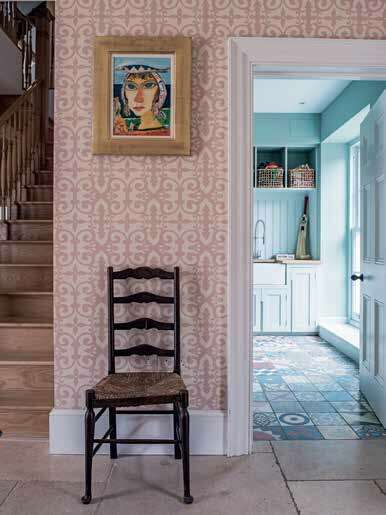 Ferne Park wallpaper in Temple Pink, £76m, Veere Grenney, veeregrenney.com. 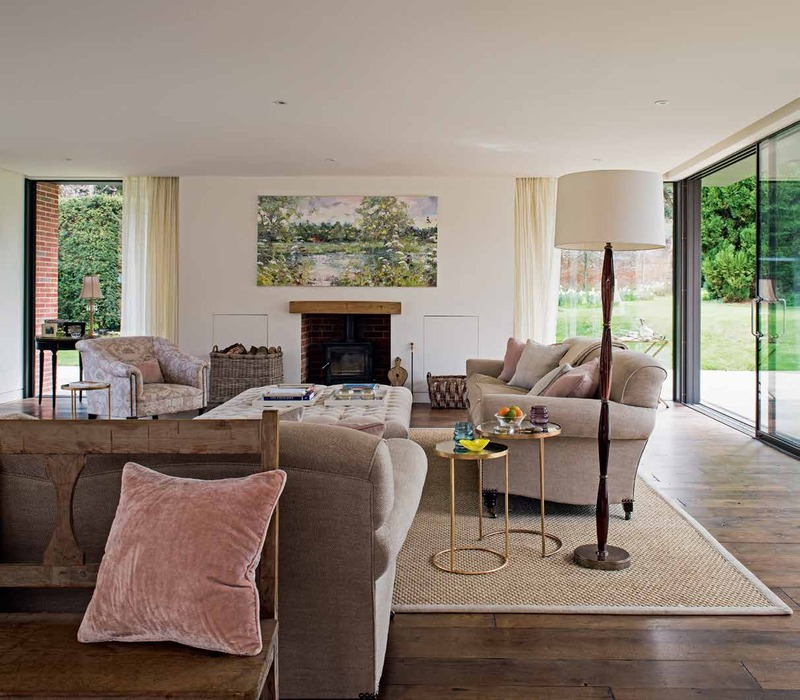 Emily and Gareth turned to architect Richard Witcher to mastermind the design concept for their new home; their brief was to open up one end of the coach house (left) to create a space with clear sight lines. The glazing (above and above right) is a striking feature of the design. Verona table lamps, from £690 each, Richard Taylor Designs, richardtaylordesigns.co.uk. Buscot Limestone Seasoned Finish flagstones, £106.80sq m, Artisans of Devizes, artisansofdevizes.com. Bespoke kitchen, Tom Bayley, Quartet Interiors, quartetinteriors.com. Architectural design, Richard Witcher, Witcher Crawford Architects & Designers, witchercrawford.co.uk. Floral arrangement, Colleen Crockett Flowers, 07799 068482. Emily sourced the eye-catching tiles having seen them used effectively in a nearby hotel. Bespoke cement floor tiles in patchwork design, Emery & Cie, emeryetcie.com. Walls and cabinetry in Glass I, Pure Flat Emulsion, £46.50 for 2.5 litres, Paint & Paper Library,paintandpaperlibrary.com. Antique furniture, which was inherited from Emily’s mother, sits comfortably alongside new pieces in this restful space (left). Georgian chair with seat cushion, £2,540, George Smith, georgesmith.com. 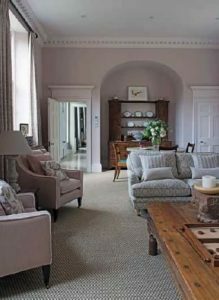 Armchairs in Verandah in Temple Pink, £150m; sofa in Soundess in Sage, £156m; both Veere Grenney, veeregrenney.com. The couple commissioned artist Paul Treasure to paint a view of the coach house as seen from a lake on the estate. “Our view of the lake is now obscured, so it’s wonderful to see it immortalised,” says Emily. Artwork by Paul Treasure, paultreasurepaintings.co.uk. Armchairs in Anthea in Mauve, £154m, Madeaux by Richard Smith, madeaux.com. When Emily and Gareth Hunt decided to trade their smart London postcode for the tranquil beauty of the South Downs, they envisaged an idyllic, carefree existence away from the hubbub of city life. 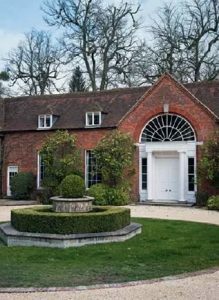 However, the lure of an elegant Georgian coach house threw an unexpected curveball at the couple and their two young sons: the historic property had been split into two inthe early 1970s, and a substantial, not to mention disruptive, renovation was needed in order to make it whole again. Emily tells us more. What state was the coach house in when you bought it? It was two separate, and very di≠erent, properties. We bought one half first, which was a recently renovated private residence, and we were able to move straight in, although it required some redecorating. The second part was being used as a hydrotherapy centre when we bought it eight months later, and was unsuitable for habitation. What structural work did you do? 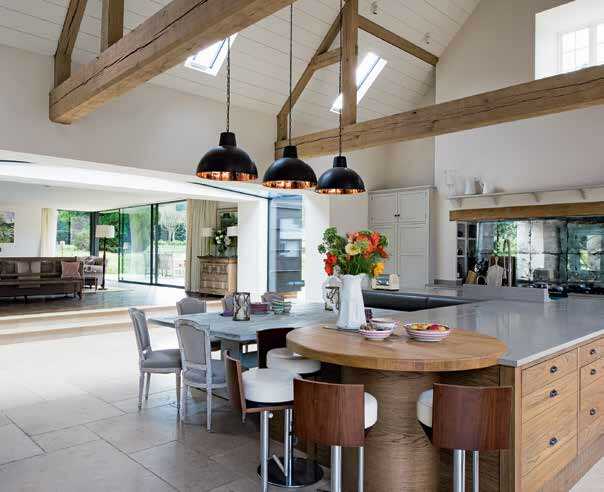 We began by stripping out the hydrotherapy centre to create a double-height kitchen-dining room, adding depth to the layout by gently extending into the garden. It’s a generous space, so we carved out a separate dining room and a boot room as well. As the work progressed, however, it became clear that the historic trusses in the kitchen needed to be replaced. Our architect, Richard Witcher of Witcher Crawford, did an incredible job of replicating the original design, which he finished with well-seasoned, air-dried oak that will age beautifully over time. Were there any notable challenges? 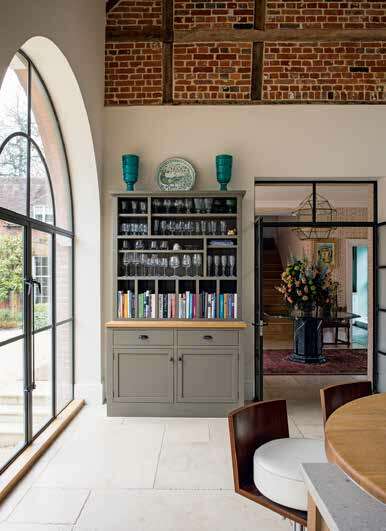 The lovely arched windows in the kitchen were a little tricky. Originally, these were doorways, and they all lean slightly to the left and tilt out at the top, which meant each window and trim had to be specially made. It was worth it, though. 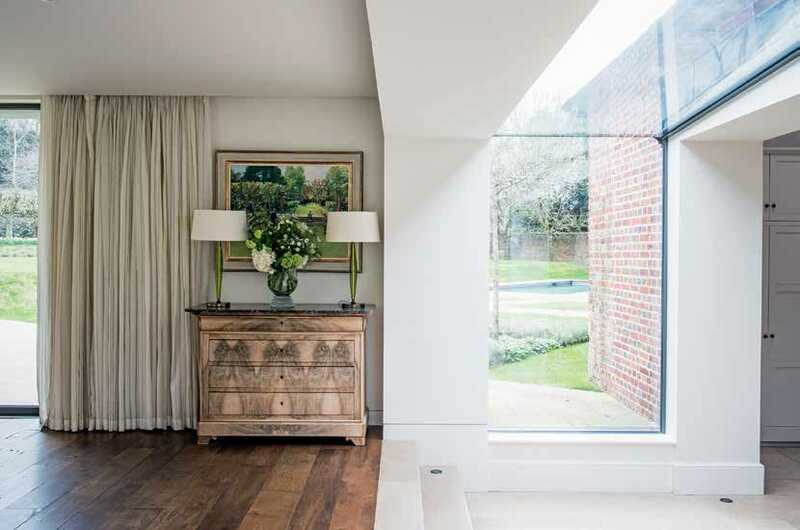 They enhance the openness of the design, which was Richard’s main concept for the space, and provide wonderful visual access to the garden through the glazed extension. Did you have any help with interior decoration? I met interior designer Sophie Head through a friend, so I was already familiar with her work. 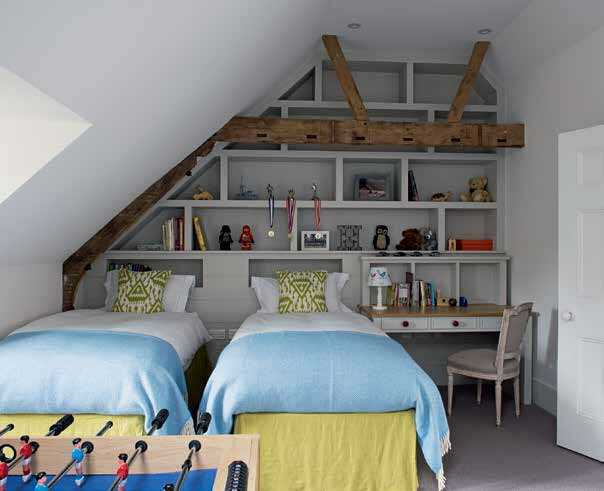 The brief was for a welcoming, comfortable family space, with a nod to the property’s heritage. Sophie introduced us to unfamiliar designs and different textures, and helped us to unify the scheme and improve the flow. 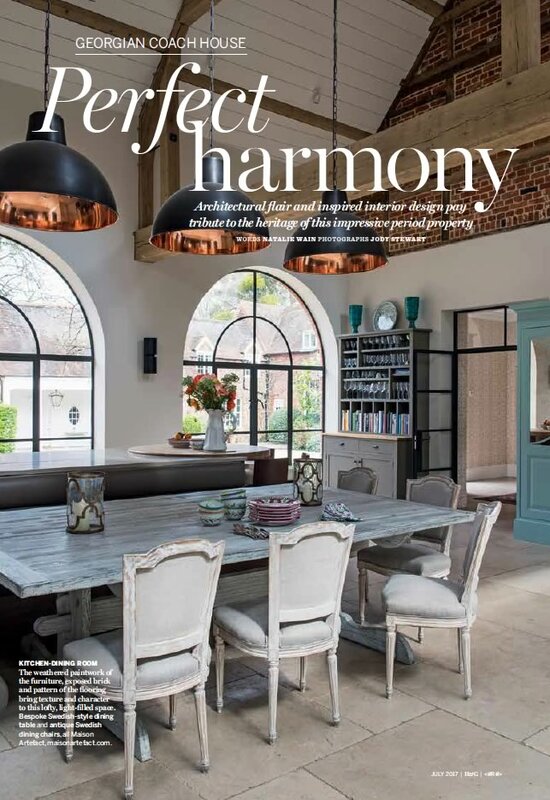 We spent a lot of time perfecting the lighting, particularly in the kitchen and the garden room, where the glass and high ceilings were a challenge. How did you decide on a look? Sophie and I did a lot of shopping together, and I would pick out ideas from magazines which she would then develop. The house is wonderful for entertaining, but with two young boys and a dog, it had to be practical as well as pretty. The hand-blocked Veere Grenney wallpaper in the entrance hall has the wow factor we were looking for, but we settled on a more muted scheme for the garden room. Delicate ﬂoral fabrics are cheerful and add personality, while the wooden flooring and sisal rug feel robust. The house is an expert blend of traditional and contemporary elements; the perfect reflection of our family. 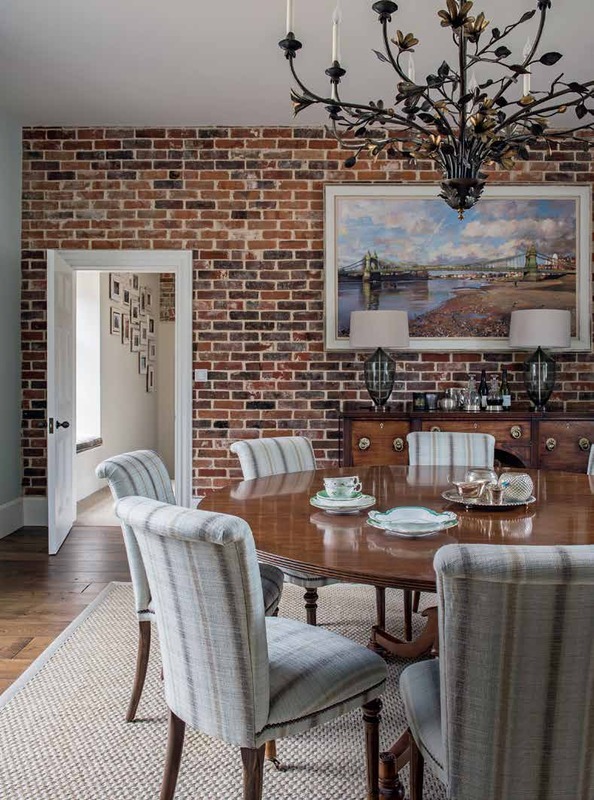 The exposed wall, made with bricks reclaimed from elsewhere on the estate, provides a rustic contrast to the classic elegance of the furniture. The lighting throughout was painstakingly chosen for each room. “Every leaf of this chandelier was hand-finished with bronze,” says interior designer Sophie Head. Customised Magnolia chandelier, from £3,864; Richard Taylor Designs, richardtaylordesigns.co.uk. Alice side chairs, £1,165 each, William Yeoward, williamyeoward.com. 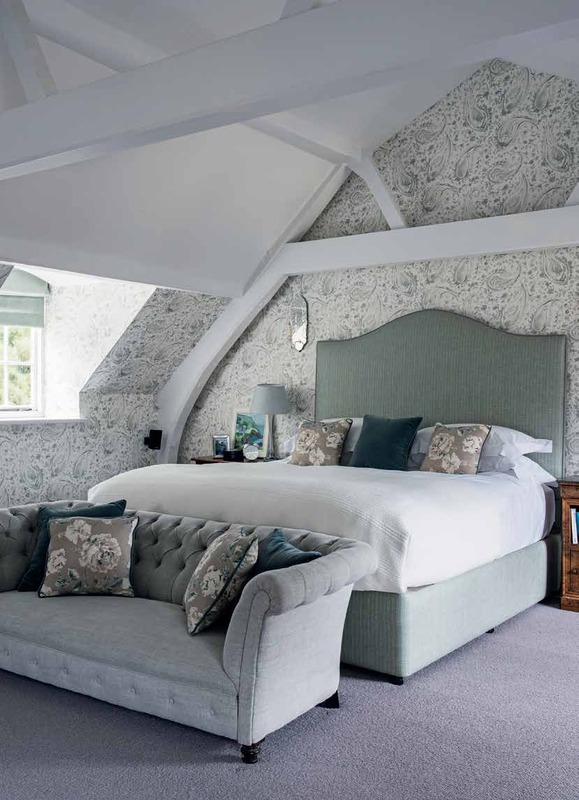 Interior design, Sophie Head Interiors, sophieheadinteriors.co.uk. The paisley pattern on the Nina Campbell wallpaper adds a note of drama without compromising the tranquil mood of this space. Scalloped Edge mirror wall light in Silver, £390, Vaughan Designs, vaughandesigns.com. Pamir wallpaper in Grey, £61 a roll, Nina Campbell at Osborne & Little, osborneandlittle.com. Headboard in Turin in Stone Iris, £224m, Rose Tarlow, rosetarlow.com. Emily fell in love with this metallic bathtub (above left) during a visit to the luxury design show, Decorex. She and Sophie created the rest of the scheme around it. 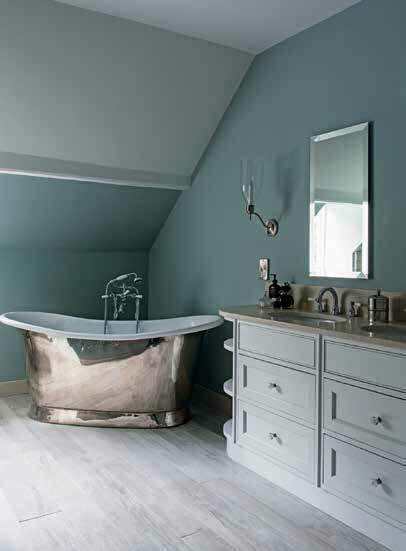 Bespoke Bateau bath, William Holland, williamholland.com. Seaton Bathroom Storm wall light in Chrome, £396, Vaughan Designs, vaughandesigns.com. 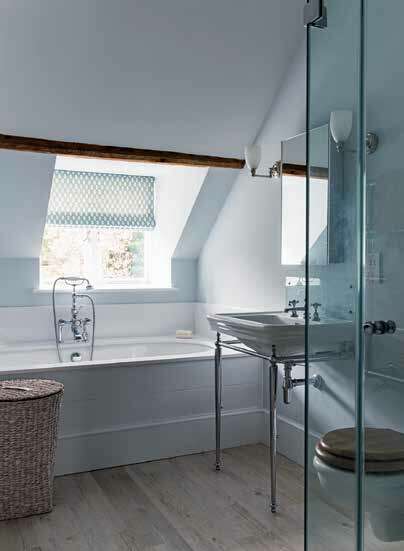 The chrome washstand (above) adds period elegance to this simply decorated room. Kensington basin and washstand, £1,250, Fired Earth, firedearth.com. 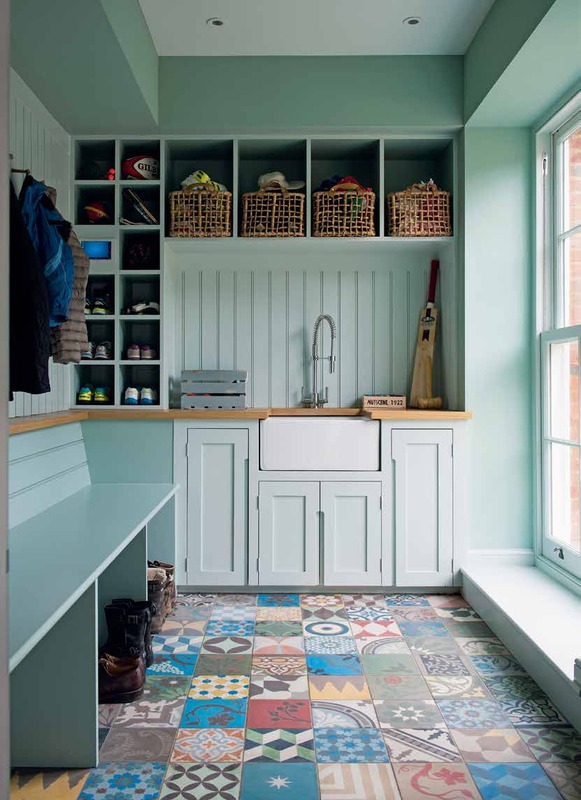 Kitchen designer Tom Bayley designed and built the shelving (left) for Emily’s son, who chose the blue and green palette himself and which she says reflects his playful personality. Cushions in Vientiane Ikat in Palm, £152.20m, Schumacher, fschumacher.com.